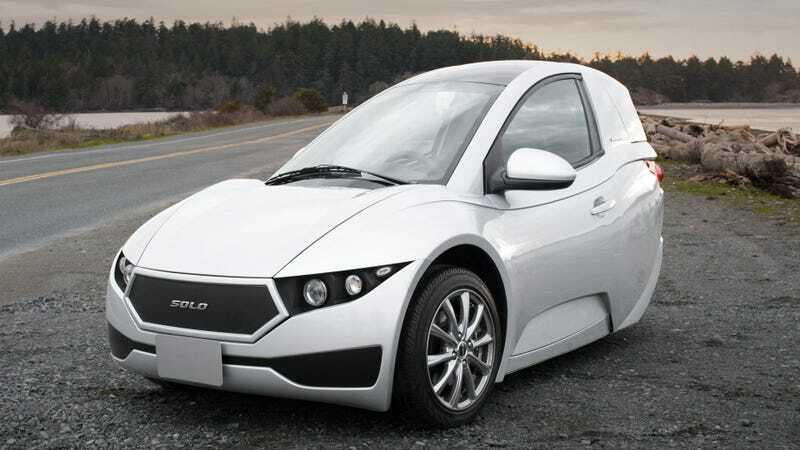 The Electra Meccanica Solo is a slipper-shaped three-wheeled electric vehicle named for its passenger capacity. Which is “one,” obviously. Tomorrow I’m going to test drive it and talk to the company’s director of U.S. operations to find out what the deal is here. Got any questions for me to bring? So far all I know is what I found on the company’s website: a claimed range of 100 miles, an 82 mph top speed, and a charge time of three hours on a 220-volt plug. The company was founded in Italy decades ago and is now headquartered in Vancouver. The Solo does not appear to be a performance monster, the stated 0 to 60 time is a casual eight seconds. And as you can probably imagine, this is a car for people who travel light, as cargo capacity is just over 10 cubic feet. But it is inexpensive. Or at least it will be, if and when it hits the mass-market. Electra Meccanica puts the list price at “an anticipated” $15,500. What the company’s current plan for sales and service is will be one of my main questions after driving the thing, but the place I’m going to see it has been described as “a dealership” so at this point it sounds like they’re off to a start. If nothing else, it looks like a car with a good sense of humor. I’m looking forward to seeing what it’s all about.